When, in 2010, a record kicks off with a cute repeated xylophone figure and a muzzy, mournful wail followed by an outburst of pummeling percussion, you immediately feel certain you can trace its inspirations back to a certain record released last year to zealous critical acclaim by Animal Collective. And so it proves on 'The Trailer and the Truck', the opening track on Jet Lag, the debut solo record by Why? 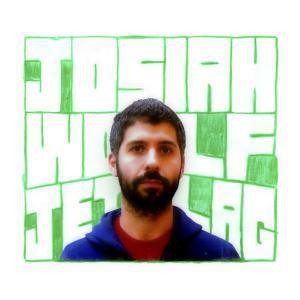 's Josiah Wolf. Jet Lag has none of the hip hop stylings which form a delicately balanced counterpoint to the alt-country music Why? trade in. It also, for the most part, eschews the electro experimentation which makes both Why? and, for that matter, Animal Collective such an interesting listen. What Jet Lag has in their place is a rootsy, folksy honesty running through its songs. It's alt-country alright, just with the 'alt' turned right down most of the time. Beyond the Animal Collective influence, Jet Lag sounds closest to the fragile, ramshackle music of Mark Linkous' Sparklehorse, although you sense that, however maudlin songs such as 'Master Cleanse (California)' and 'Skull in the Ice' might be, Wolf can shake off his blues with a simple walk in the woods rather than resorting to suicide, as Linkous tragically did this year. Such a comparison is not meant to imply that Wolf is not '4 real', or any such nonsense. It's just that Jet Lag is a determinedly gentle listen, quietly reserved and strong about any emotional turmoil might detail. Apparently, this album was written following the dissolution of a long-term relationship and there are clues to this peppered throughout the album. "My apartment smells like divorce," Wolf murmurs over the early REM jangle of 'The Apart Ment', but you get the impression that this is the kind of observation Hemmingway would have made, one that hints at deeper emotions without actually exploring them. This lachrymose but determinedly upbeat approach produces some great moments, most especially the coasting country rock of 'The New Car' and the sparse, dreamy surf rock of 'In the Seam'. But overall, Jet Lag is a little too pretty and bloodless. Throughout, Wolf sounds like no one so much as a junior John Denver, strumming out the homespun homilies of 'Take Me Home, Country Roads'. Listening to the ridiculously pleasant likes of 'Gravity Defied', you do wonder if Wolf has actually worked through his emotions or if he has merely engaged in some time-consuming avoidance. Whatever, that's for him to know. But it's a shame because, ultimately, Jet Lag is quite a boring record.